Turns out that I wasn’t the only person travelling to see Saratoga Russell make it back to the races. Arriving at Monmouth after a remarkably traffic-free trip early Sunday afternoon, I headed to the paddock to see Saratoga Russell in racing tack for the first time since March of 2008. 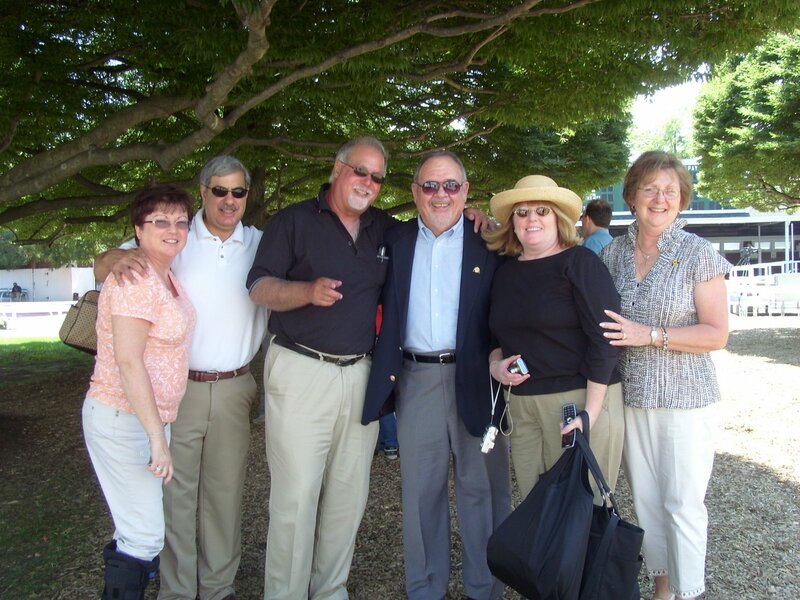 I was on the early side, and thought that I might be the first one in the paddock, but four people had beaten me: Larry and Beverly Abner, and Jack and Lois Dobbyn. The Abners had travelled from Cincinnati, the Dobbyns from Valley Forge, Pennsylvania, and their excitement made me look uninterested by comparison. They were friendly and gracious, eager to see their horse run but willing to talk to a stranger, to share their anticipation. They posed under a tree, along with two other people I didn’t meet, before heading to the clubhouse to watch the race. 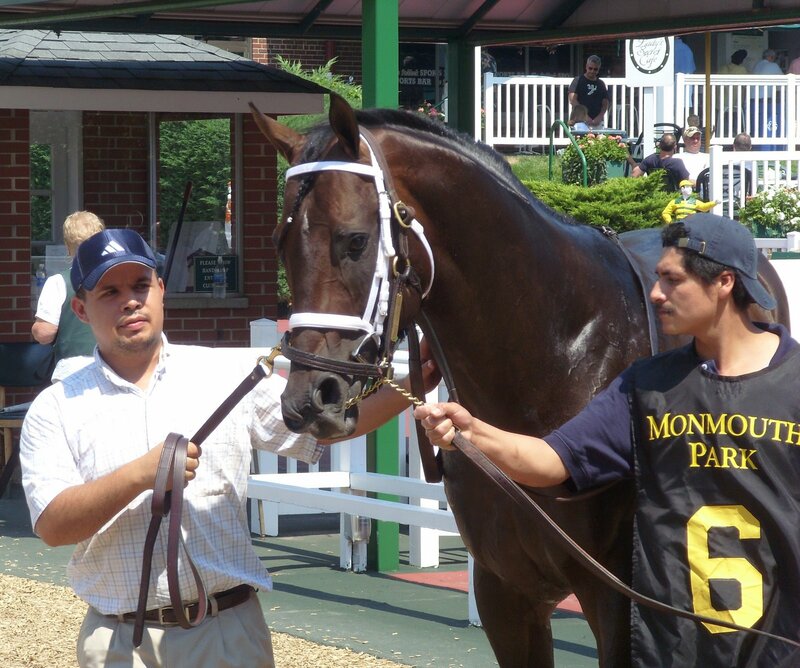 I have to say that I agreed with them: Saratoga Russell is big and muscled, and he was on his toes in the paddock. The day was warm and he was a little sweaty, but he seemed eager rather than nervous. Breaking off from the post parade, jockey Alfredo Clemente jogged Saratoga Russell past the other horses, the colt’s energy evident; following the break, Clemente took him—or was it the other way around?—to the front, setting fractions of :21.95 and 44.44. 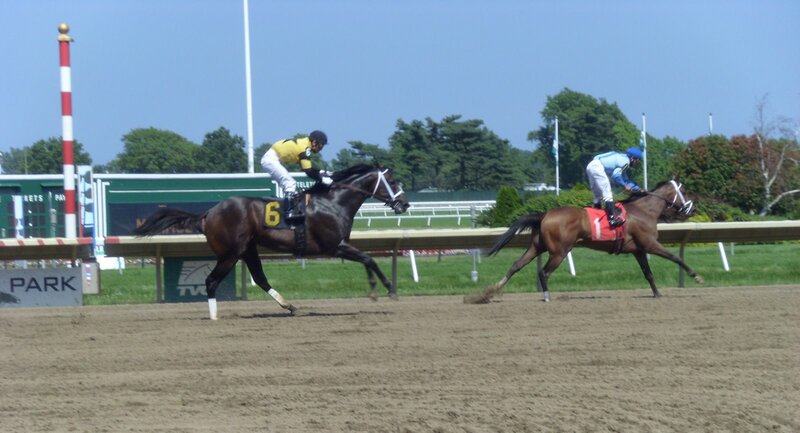 Hearing the time for the quarter, I was reminded of Saratoga Russell’s first race…and of its outcome. He held the lead until mid-stretch, when he drifted out to the middle of the track; Bythebeautifulsea (there’s a hunch bet for you at Monmouth) came up in the inside and overtook him, winning the race by nearly two lengths. When Saratoga Russell got himself straightened out, he came back a bit, and it seems likely that he’d have won if he’d have remembered to change leads, and if he had stayed straight. Woulda, coulda shoulda. 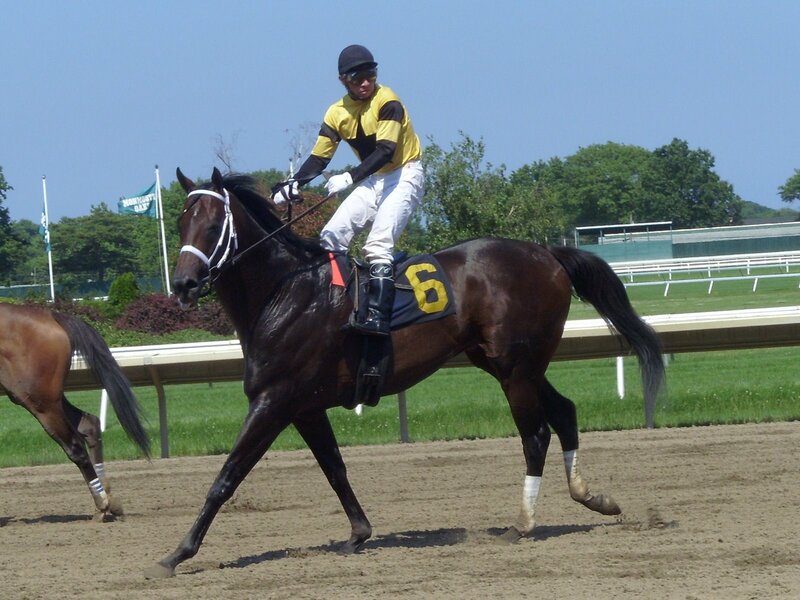 Despite the loss, Saratoga Russell’s owners and fans have reason to be encouraged: the colt experienced none of the breathing problems that have plagued him in the past; he finished the race full of energy; and back at the barn after the race, he was his usual playful and aggressive self. Andrew St. Lawrence, Kiaran McLaughlin’s Monmouth assistant, declared himself reasonably happy with the race, and hopeful about Saratoga Russell’s next start. The road to this race was a long one, both metaphorically and literally. The script might have been written with a win awaiting those who had travelled to see this comeback, but after all the months and treatments and work since Saratoga Russell last raced, even a second place finish felt kind of like a victory. Next time, maybe we’ll get the real thing. Next stop for Saratoga Russell is the Winners Circle. Great to see him back at the races. From your mouth to the racing gods' ears. I thought he looked pretty good for a horse who hadn't raced in fifteen months! I'm thinking Bythebeautifulsea needs to ship to Del Mar for his next start. I have been waiting for this day to come what feels like forever. 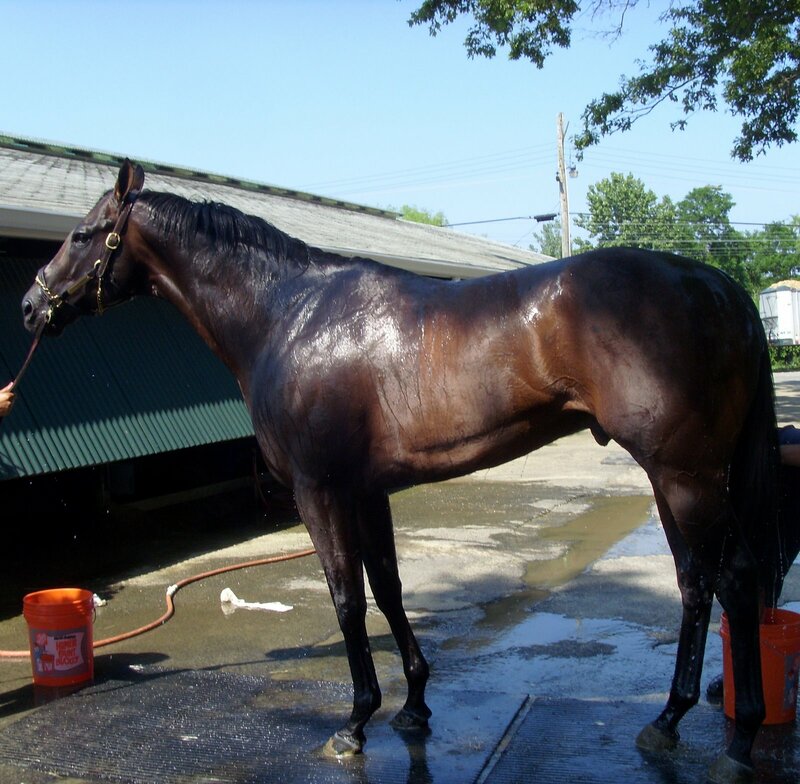 Saratoga Russell ran a great race and yes he will be back in the winners circle NTO!!! Congrats Larry!! Entered on opening day, as I'm sure you're aware. Congrats to him on today's win! !